If someone had told me in college that I would end up getting an MBA and running a business, I would have been offended and said something like “well, you must not understand what I stand for.” It took me a while to figure out how my diverse interests in anthropology, fair trade, social justice, women’s rights, and international development would come together into what everyone was urging me to get: a “real career”. The fact that these interests would all find a home in business sometimes still surprises me. As a social entrepreneur running Prosperity Candle, many would still argue that I don’t have a “real career”, but to me, this is the most meaningful and important work that I’ve done. 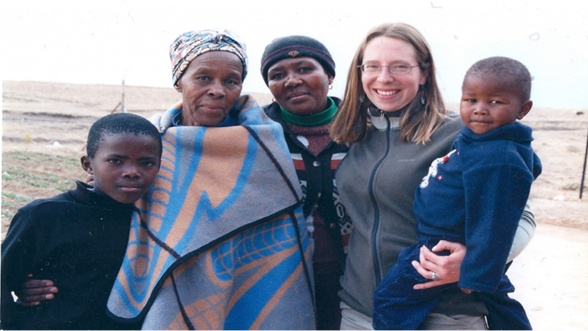 To better understand how I came to see the potential for business to empower women economically and socially, I should tell you more about my work in the Peace Corps in a small southern African country called Lesotho. For three years my days were defined by handspun mohair, accounting ledgers, emails written in awkward English, “Marketing 101” posters, business plans, hand-woven carpets, and laughing, boisterous women. I woke up every day with a sense of fulfillment and a clear vision – to strengthen the Elelloang Basali Weavers’ business. This period was one of the most challenging and exhausting times of my life, but it was also one of the most engaging and enlivening. I was working with a women’s weaving business. My role was to facilitate the creation of a business strategy that would secure a steady and livable income to support the 30-plus weavers and their families. Today, Elelloang Basali continues to grow and support an ever-increasing number of employees and their associated families and communities. The founders of the business value financial profit just as much as their ability to pay livable wages, provide health education to members, supply weavers with fresh vegetables and medicinal herbs from their garden, and support the extended Elelloang “family” (composed of elderly weavers and deceased weavers’ orphaned children). In a country with little employment and deteriorating health outcomes, their work is absolutely vital. Despite the importance of their work, however, I found that businesses like Elelloang Basali had trouble truly helping women move out of poverty. In part this was because of the nature of their weaving style – each piece was time-consuming and expensive to make, thus making it difficult to ensure women could be paid as much as they deserved for their time. They also had trouble helping women move out of poverty because their business is isolated. They are a world away from global markets and from the support that a business like this needs to succeed. I left Lesotho determined to support women entrepreneurs to build their businesses as a way to change the lives of their children and, by extension, their entire communities. But I also left knowing that there had to be a better way to make this work succeed. After working more in international development and with fair trade organizations, I decided to pursue an MBA. I had found that although business was the vehicle for the change that so many fair trade and development agencies were using to empower women, too few people had the actual business skills to make it work. While working on my MBA, I reconnected with Prosperity Candle’s co-founders, Amber and Ted, and learned about the concept that they were piloting to empower women economically in Baghdad, Iraq. Without hesitation, I agreed to intern with them to help launch the pilot, seeing that this business model pulled together everything I was looking for: a market-based approach, a focus on women in the most distressed parts of the world, true partnerships that support existing work, and an aspiration to help women not only survive, but truly thrive. And I loved that Prosperity Candle was going to dive in deep with women and support them with training, design inputs, market access, and commit to working with them over the long haul. Prosperity Candle creates gifts that change lives. Every candle is a vehicle for social change and global connection. We work with women to help them set up their own independent candle-making businesses that are uniquely suited to their situation – home-based in Iraq and workshop-based in Haiti – and then connect them to global markets. Each candle that we sell comes with the name of the woman that made it, which allows the end recipient to go onto our website to read her story and connect with her by sending her a simple message of support. Although incredibly rewarding, it’s been challenging to do this type of work. It’s never easy to break the mold on what businesses are “supposed” to do. We take on much more than most businesses ever would and thus sometimes have trouble getting support to grow – especially in terms of raising capital. Luckily for us, though, more and more people are thinking about the impact of the products they buy. People are thinking about fair trade, organic, “one for one”, and the maker behind their product. Thanks to these self-proclaimed conscious consumers, our work is growing. One of our greatest successes to date has been working with a wide variety of organizations to create custom candles for their events and gift-giving needs. While creating a line of corporate and donor gifts doesn’t sound that exciting, the volume of candles we’ve been able to sell through this channel has helped us in two major ways: 1) We’ve been able to offer more regular work to the women we work with, thus helping us grow our impact and the sustainability of our work. 2) These orders have helped us develop long-term relationships with like-minded organizations that value our mission and want to align their work with our own. We’re proud to have created custom candles for Kiva, eBay’s Women’s Initiative Network, PAX World, the Women in the World Summit, Harvard Social Enterprise Conference, and World Vision. Our team is gearing up for an expansion into Haiti this year. We cannot wait to begin training women in candle-making in Northern Haiti. This aspect of our work will build on our foundations in Iraq and with Burmese women refugees. We’re looking to empower women globally with our model, so keep your eyes out for our work in Rwanda, Afghanistan and elsewhere over time. Want to see firsthand how a gift can change a woman’s life? Show Mom how much you love her by giving her a gift that changes another Mom’s life forever. Visit our website to find out more about our Mother’s Day gift collection!